Have a beautiful antique radio that’s beyond repair? 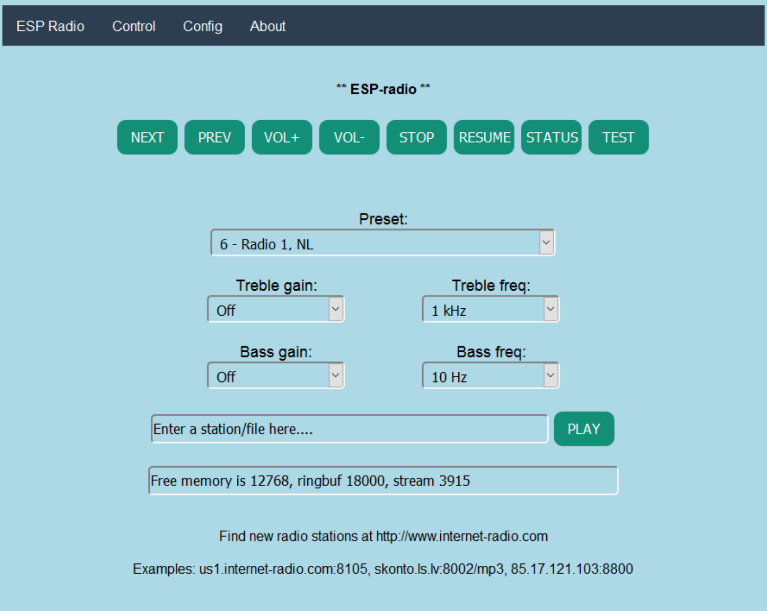 This ESP8266 based Internet radio by [Edzelf] would be an excellent starting point to get it running again, as an alternative to a Raspberry-Pi based design. The basic premise is straightforward: an ESP8266 handles the connection to an Internet radio station of your choice, and a VS1053 codec module decodes the stream to produce an audio signal (which will require some form of amplification afterwards). Besides the excellent documentation (PDF warning), where this firmware really shines is the sheer number of features that have been added. It includes a web interface that allows you to select an arbitrary station as well as cycle through presets, adjust volume, bass, and treble. If you prefer physical controls, it supports buttons and dials. If you’re in the mood for something more Internet of Things, it can be controlled by the MQTT protocol as well. It even supports a color TFT screen by default, although this reduces the number of pins that can be used for button input. The firmware also supports playing arbitrary .mp3 files hosted on a server. Given the low parts count and the wealth of options for controlling the device, we could see this device making its way into doorbells, practical jokes, and small museum exhibits. If you’re looking for a hot collectible item and a great restoration project, cathedral-style radios from the 1930s are a solid choice. But they’re getting harder to find as the years roll by, so if your heart’s content is to listen to modern broadcasts through a radio with a classic look, you may need to roll your own cathedral case for an internet radio. The cathedral-style case was a hugely successful form-factor for radios back in the day, with variations on the arch-top theme ranging from Gothic to Art Deco. For this build, [nick.r.brewer] decided on a more parabolic arch. His build log has SVG files for the individual ribs that were cut from plywood with an X-Carve. A Raspberry Pi and TFT display were mounted inside the finished case, along with a Bluetooth module and a 20W amplifier and speaker. A big 3-pole rotary switch with custom knob selects the audio source and evokes that 1930s feel. It ended up looking pretty good, and the video after the break shows that it sounds nice, too. We featured a fair number of internet-radio-in-a-classic-case builds before, but we’re surprised to see no cathedral-style radios have been modded. Maybe it’s time to hit the flea market and estate sales and see what turns up. Sometimes hacks don’t have to be innovative to be satisfying. We thought that [daffy]’s instructions and video (embedded below the break) for turning an old WRT54G router into an Internet radio were worth a look even if he’s following a well-traveled path and one that we’ve reported on way back when. The hack itself is simple. [daffy] locates unused USB data lines, adds in a 5V voltage regulator to supply USB bus power, and then connects it all to a USB sound card. Hardware side, done! And while he doesn’t cover the software side of things in this first video, we know where he’s headed. The WRT54G router was the first commodity Linux-based router to be extensively hacked, and have open-source firmware written for it. If you’re using OpenWRT or dd-wrt on any of your devices, you owe a debt to the early rootability of the WRT54G. Anyway, it’s a good bet that [daffy] is going to find software support for his USB sound card, but we remain in suspense to see just exactly how the details pan out. Our favorite WRT54G hack is still an oldie: turning a WRT54G into the brains for a robot. But that was eight years ago now, so surely there’s something newer and shinier. What’s the coolest device that you’ve seen a WRT router hacked into? Years ago, [Luk] came across an old tube radio. He’s since wanted to convert it to an internet radio but never really got around to it. Now that we are living in the age when a micro computer can be had for a mere $35, [Luk] decided it was time to finish his long lost project. He chose a Raspberry Pi for the brains of his project because it is an inexpensive and well documented product perfect for what he wanted to do. [Luk] had a goal, to modify the radio as little as possible in order to get it to play both internet radio and locally stored MP3s. The radio from 1959 is certainly old, but it had a feature you may not expect. It had an AUX input with a separate volume knob out front. As is the radio itself, the input was mono. To connect the Raspberry Pi to the radio, [Luk] had to make an 1/8th inch stereo to banana plug adapter, a great solution that did not require any modification to the original radio. WiFi is accessed though an off-the-shelf USB wireless module. After evaluating tapping into a 5vdc source somewhere in the radio, it was decided to use a wall wart to power the Raspberry Pi. A plug for the wall wart was spliced in after the radio’s main on/off switch. That way the radio and Raspberry Pi both turn on and off together. There is plenty of room for all of these added components inside the radio’s case. The RaspPi can be fully controlled over the WiFi network but has a couple buttons wired up to the GPIO pins for limited manual control. The buttons for these controls fit perfectly in the round vent holes in the back panel of the radio’s case. Although the buttons are visible, no permanent modifications had to be made! [Luk] reports that everything works great, as do the original functions of the radio. [5 Volt Junkie] has built his share of Arduino projects, but never anything with Python, and certainly never anything with a GUI. After listening to Internet radio one day, a new idea for a project was born: a Raspberry Pi with a small touchscreen display for a UI and displaying soma.fm tracks. It’s finally finished, and it’s a great introduction to Python, Pygame, and driving tiny little displays with the Pi. Playing soma.fm streams was handled by mpd and mpc, while the task of driving a 2.8″ TFT LCD was handled by the fbtft Linux framebuffer driver. This left [5 Volt Junkie] with the task of creating a GUI, some buttons, and working out how to play a few streams. This meant drawing some buttons in Inkscape, but these were admittedly terrible, so [5 Volt Junkie] gave up and turned on the TV. Tron Legacy was playing, giving him the inspiration to complete his Tron-themed music player. The result of [5 Volt Junkie]’s work is a few hundred lines of Python with Pygame and a few multicolor skins all wrapped up in a Tron theme. It looks great, it works great, and it’s a great introduction to Python and Pygame. If you’re the type who enjoys passing idle time by keeping up with podcasts or listening to web stations but don’t always want to occupy your laptop or tablet, this Arduino based radio player will provide a base station for tunes. The Web Radio project by [Vassilis Serasidis] outlines in a pleasing amount of detail exactly how to wire up a short list of four modules. These including an Ethernet shield, LCD screen, MP3 decoder, and USB serial converter, with an Arduino Mini in order to bookmark and play fourteen of your favorite channels. His hand-soldered board couples everything into one neatly stacked package. The instructional video shows this off and he even explains how to locate your favorite stations on internet-radio.com and copy their port and IP number directly into an example sketch which is provided for use. If you’ve been wanting to build a self contained radio node for your desk free of extra baggage, this is a no-sweat project for both the hardware savvy and those more oriented with code writing. If you’re going to build your own radio, it’s always cool to disguise your high-tech creation as something more rustic. Check out this project by [Dominic Buchstaller] for a great example of a vintage radio given a second calling.